The Original is a UL 437 rated pin-tumbler lock made by Medeco. It is well known for the use of rotating bottom (key) pins that interface with a sidebar. The Original has the distinction of being the first pin-tumbler lock to use axial rotation, and is the basis for most other Medeco mechanical locks since. It was previously thought to be one of the most secure locks available, but continued research from the locksport community has proven a variety of attacks are possible, including key bumping. The Original has since been superceded by the Medeco Biaxial and Medeco M3. The Medeco Original uses five or six pin-tumblers that provide axial rotation to interface with a sidebar located at 3 o'clock. Pin-tumblers must be properly raised to the shear line as well as rotated so that the sidebar arms can fall into notches on the side of each pin-tumbler. Axial rotation is provided by the design of the bottom (key) pins and angled bitting cuts on the key. There are 6 depths available for pin-tumblers, allowing 7,776 (65) theoretical key differs in a five pin Original (excluding the sidebar). This allows for 243 (35) and 729 (36) sidebar differs in five and six pin Originals, respectively. The Original uses 2-3 mushroom top pins in each cylinder to provide manipulation resistance to traditional lockpicking. The sidebar notches on the sides of the bottom pins may also have false notches to resist manipulation by rotation. In addition, "ARX" pins are used to protect against manipulation by rotation. ARX pins close the sidebar notches before they reach the end of the pin, making it so they cannot be readily grabbed by a tool. Resistance to forced entry is provided in the form of hardened steel rods and discs. In the plug rods are in the 3, 9, and 12 o'clock positions. In the cylinder, two crescent shaped discs are placed at the 12 and 3 o'clock positions to protect the pin-chambers and the sidebar. As a secondary locking mechanism, the sidebar itself also helps to protect against a variety of forced entry techniques. Bottom pins may also have a hardened steel core to resist drilling. Five and six pin Original keys. Original and Biaxial bottom pins are not interchangeable. They are identified by the position of the flag that limits rotation. The flag is 90° from the true gate in the Original and 180° in the Biaxial. Disassembly of the Original is simplified compared to other sidebar-based locks because there are no additional finger pins used in the sidebar. When reassembled the sidebar must be pointed down, with the ball bearing facing the front of the plug. 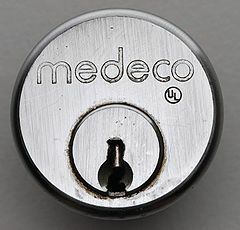 The validity of key bumping attacks against Medeco cylinders has been debated between Medeco and the locksport community. Research done by Marc Weber Tobias and Tobias Bluzmanis has shown these systems are vulnerable to a wide variety of attacks, including bumping. Lockpicking attacks against this lock were previously thought extremely difficult due to axial rotation. A tool called the "Medecoder", developed by Jon King, made this process much easier and at the same time allowed for decoding of the sidebar code. This page was last modified on 1 October 2010, at 06:20. This page has been accessed 43,401 times.